Jessica Aiken-Hall lives in New Hampshire with her three children, three dogs and her fiance. She is a graduate of Springfield College, with a Master’s Degree in Mental Health Counseling. She is a Reiki Master, focusing her attention on healing. As a social worker, she uses her life experience to help others in their time of need. Jessica was recently a guest on the Dr. Phil show, where some of the issues from her memoir were discussed. When it comes to memoirs, there’s one thing writers need to remember: people love happy endings, especially when the writer’s life has been filled with struggle and heartache, as was Jessica Aiken-Hall’s life in The Monster That Ate My Mommy. That monster nearly finished off Jessica too as she spent the years from early childhood into adulthood searching, in all the wrong places and with the wrong people, for the love she wasn’t getting from her mother. Typical of abused children, Jessica was desperately lonely and desperate for love. The only person through most of those years who showed her true love was her grandma. But Gram’s love wasn’t enough to sustain Jessica. She hooked up with several men, even when her gut told her it wasn’t a good idea, because her mother’s rejection made her doubt that she was worthy of love. She made a lot of bad choices and decisions along the way. But ultimately, as readers of Jessica’s story hope, Jessica finds the strength she needs inside herself as she raises her three children, and life finally brings the right person her way. Today, Jessica Aiken-Hall is a social worker and Reiki master, focused on helping others heal as she did. This is the happy ending readers look for in memoirs. 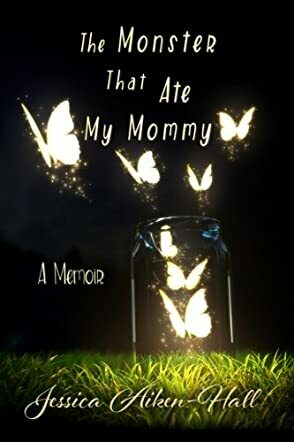 The Monster That Ate My Mommy by Jessica Aiken-Hall is an easy to read book in terms of language and style, but may be triggering for others who have suffered domestic, sexual or physical abuse. But we need books like this, written by those who understand what it’s like to feel unloved and unworthy through no fault of their own. Jessica Aiken-Hall was one of those. The Monster That Ate My Mommy should enjoy a wide readership as there are so many others who will identify with Jessica and her story.